Finesse Top is the latest model in the Finesse range. It is similar to the Finesse Plus, but the main difference is the bottom mounted reserve parachute container with an easily accessible side mounted deployment handle. It differs from the original Finesse in having a different back section and several other features not available on the Finesse. The Finesse range is based on a new webbing geometry and form. 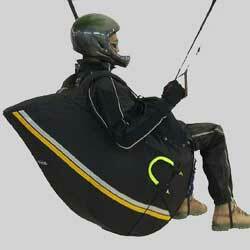 The new geometry includes a floating seat-board which eases moving in and out of the harness, as well as giving a better aerodynamic position while in accelerated flight. 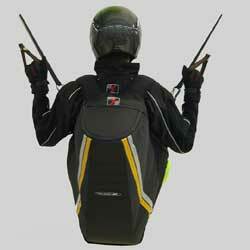 The Finesse range of harnesses has a unique pilot protection system. This protector is based on a sheet of Lexan which forms the outermost layer of protection. The layer spreads the load onto the internal foam airbag protector (optional). 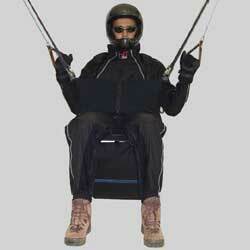 In addition, the protector gives the harness a superior aerodynamic form in flight. 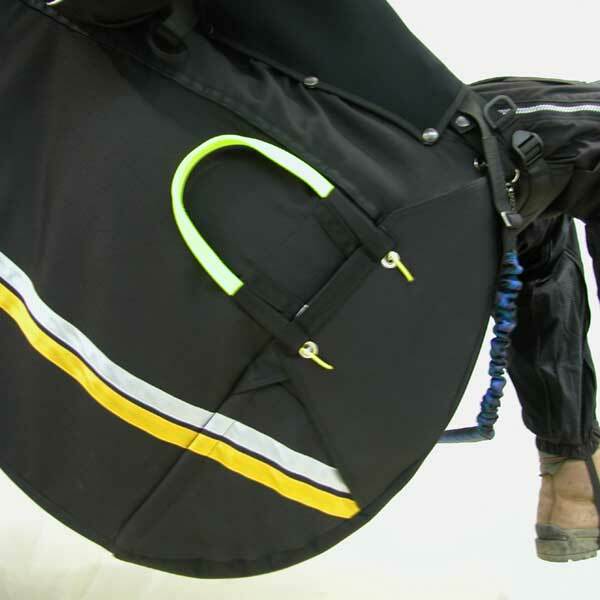 The Finesse Top has a bottom mounted reserve parachute container, Foot Stirrup (optional) for supine flying and extra comfort and a front fairing (optional) which improves the aerodynamics of the harness and keeps the pilot warm. Redesigned back shape. Improved freedom of head movement. Separate storage space for backpack. Closed sides next to hips. Bottom mounted Reserve. Foot Stirrup for supine position (optional). Economy, style and quality in one package. A variety of adjustments for individual flying styles and performance. A good blend of comfort and pilot protection with ample storage space. Excellent for weight shift steering. The Finesse is available in two sizes: S/M and L/XL. This version of the finesse has two Polystyrene side impact protectors (optional). These protectors offer superior protection while giving a significant reduction in weight in comparison to the traditional foam and fiberglass type side protectors. It is possible to order your Finesse with many different options, either factory installed before shipping or added later, including four different reserve parachutes, back protection systems and a side protector. The Finesse has a complete and detailed Online Users Manual. Click on the links below to find more details about pilot protection and other aspects.